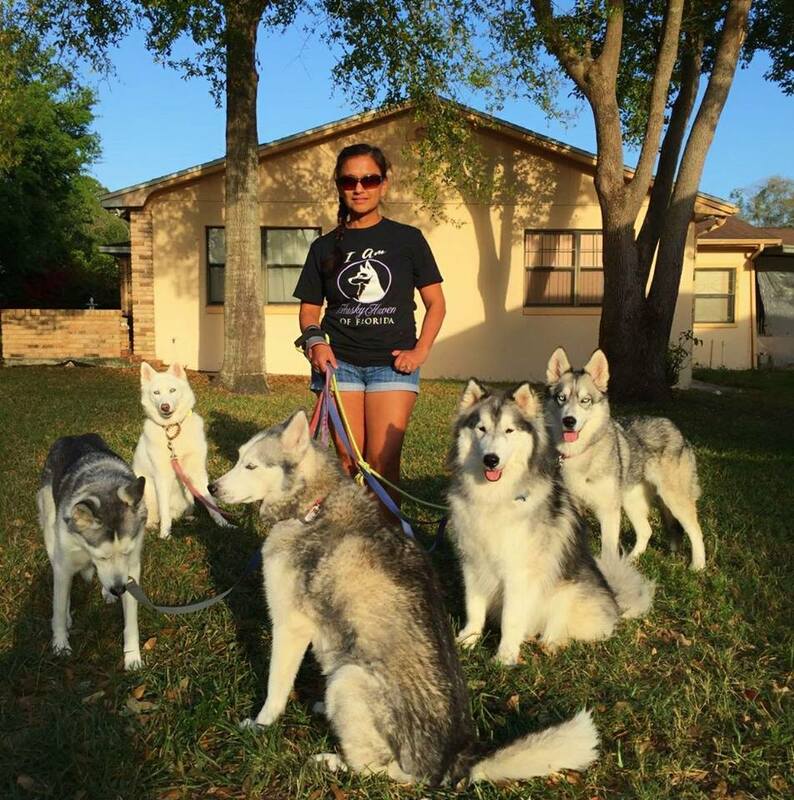 We, at the Husky Haven of Florida, strive to Rescue stray, surrendered Siberian Huskies. We provide foster homes and medical care until a suitable new forever home is found. Below you'll find a few of the Siberian Huskies/mixes we've helped place in homes. My journey in rescue started with a white husky named Scarlett who is now 12 years old and is one sassy princess. Believe it or not I did not even realize my passion for dogs until I was 36 all thanks to Scarlett. My husband and I currently have five huskies all with difference personalities. There isn’t a day that I don’t look at my dogs and think how incredibly lucky I am to be their mommy. Rescue is important to me because my hope is that one day we won’t have to. Nothing makes me happier to know a life was saved and has become an important member of a family. I believe that every dog should have a life of unconditional love, because all they want to give is their heart! About 3 and a half years ago I adopted Asia - who was the best thing that had happened to me, since I was going through a bit of a ruff spell. This was the time I met Francia and offered to help in anyway I could since I am in South Florida. I was just a volunteer then for whoever needed my help with animals who were in need. I started transporting, I would do this all day on Saturday and Sundays. This experience opened my eyes to a whole new world I never knew existed. I realized this is my passion, I always loved helping people but to help animals who need it more since they have no voice was a most rewarding accomplishment. I have never been the same since. I couldn’t imagine a life without rescue being part of it. I moved to Central Florida from the Finger Lakes Region of NY in 2015 where I had been a bookkeeper at my local municipality, a member of my local emergency medical services unit, and was a volunteer firefighter. I adopted my first husky, Kalli, who was 6-7 at the time a few months after moving to Florida, my second husky, Hitomi, joined my family 4 months later. I have enjoyed volunteering with Husky Haven of Florida since the beginning of 2017. I started with helping with transports and then fostering. I’ve truly enjoyed fostering. During the first 9 months I fostered more than 20 dogs and have only failed one time (Elsa) …. so far. I’ve been putting my administrative skills to use as Secretary on the Board of Directors and in addition to helping with daily operations, I work with an outstanding team that process applications. I am thankful for the support that I continue to receive from my husband and two sons who help in between classes at UCF. 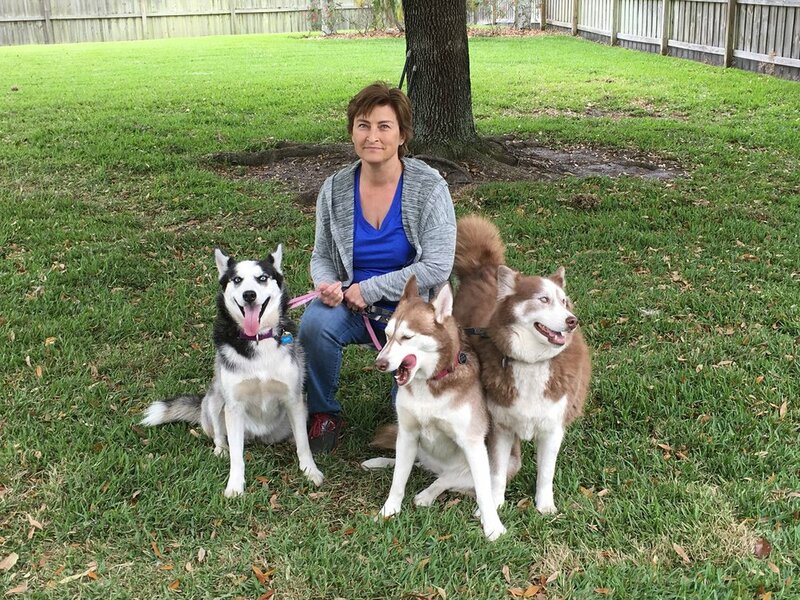 I have enjoyed my new-found family of volunteers within Husky Haven of Florida and I love knowing that I have helped to bring so many dogs and families together. It all started with a husky named Colbert. He was a classic black and white with soft blue eyes and a sassy attitude that said he was handsome and he knew it! As my husband (then boyfriend) said, he was a babe magnet, I will agree he certainly didn’t hurt the equation! Colbert was our first husky rescue at 5 years young, a true gentleman! He showed me all the amazing qualities of the breed, conveniently leaving out a few of the more challenging ones! Despite the endless hair, damaged furniture, shredded shoes, unsolicited landscaping services, the constant fear of a jail break, and the early morning serenading; the love and joy a husky adds to my life far out weigh it all. Animals have always been a part of my life and animal rescue something I hold dear to my heart, so I jumped at the opportunity to become a part of this team of passionate people. Together we are spreading the joy of being owned by a husky while helping all those sweet souls find the right human to love and appreciate them for the rest of their lives. I grew up loving all animals, especially huskies! I got my first Husky, Kyra, when I was 19 years old and she completely changed my life. I had her until she was 15 years old, and I guess you could say she was my "soul dog". I made a commitment to her that I would carry on her legacy by saving other Huskies in need. So here I am. My husband and I recently moved from Denver, CO to Tampa. We live with our Shepherd mix, Husky/Mal mix, Piebald Husky (not pictured yet), and four cats. All of our animals are rescues, and each one of them is amazing in their own way. I love saving these helpless souls and finding them their forever. In April of 2018, I was determined to start fostering dogs. Among the reasons for wanting to foster, was that I wanted a buddy with whom my Husky, Shadow, could play. I knew next to nothing about rescue, but I have a strong love and respect for animals and am drawn to the Husky breed. I love HHOFL and its vice president, Kim, because they took a leap of faith with me. On my birthday, they sent me one of the best birthdays presents I could have received, my first foster ever, Leonard. That was it; I was hooked. I started bugging Kim daily for more fosters. I fell in love with each and every one of them. When my house was full of all the husky fur and kisses, I could fit, I realized, I wanted to do even more. I had learned so much in such a short time and wanted to share that knowledge. I knew it was important to educate everyone, not only about this breed, but rescue in general. I feel lucky every day to be a part of finding forever homes for these beautiful and loving creatures. In our first 6 months of fostering, my family and I fostered 21 dogs. We also added a new Husky member to our family. There isn’t a weekend that goes by that I am not volunteering at an event, doing an assessment, or transport, and I wouldn’t have it any other way! I am also very proud to have my 8-year-old daughter involved. She is the next generation of rescuers, after all.